Click here to view current Intermediate Care/Telemetry opportunities. 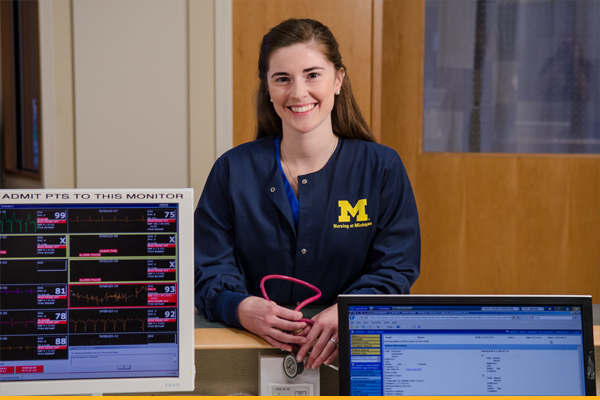 The University of Michigan Health System is a comprehensive academic medical center with facilities and resources designed to care for the complete spectrum of patient needs. For those patients who are too ill for acute care units, yet who do not require intensive care, our system offers an impressive network of specialized Intermediate Care units. A 36-bed adult telemetry step-down unit specializing in the delivery of care to post-operative patients who have undergone cardio-thoracic surgeries such as heart valve replacements/repairs, coronary artery bypass grafts (CABG), left ventricular assist devices (LVAD) implants, heart and lung transplants, various lung surgeries and esophageal surgeries. Our philosophy on 4C is “Patients and Families First”. We support this philosophy by providing compassionate care. We pride ourselves in ongoing patient education, making sure that our patients and families understand their plan of care and participate in that plan as much as possible. This improves the patient and family outcomes and eases anxiety at the time of discharge. We have an interdisciplinary and collaborative Team on 4C. The Team includes Physicians, Registered Nurses, Physician Assistants, Nurse Practitioners, ICU Technicians, Physical Therapists, Registered Dieticians and Pharmacists to coordinate our care from admission to discharge. This Team focuses on individual patient needs to support our patients and families. 4C offers a comprehensive orientation program, as well as ongoing staff education, with Team members who are willing to support one another each step of the way. We provide a great opportunity to utilize current clinical skills and enable you to build new skills as well. A 24-bed unit, specifically designed for the quality care of intermediate cardiovascular patients. CVC-5 is a state-of-the-art facility, utilizing an interdisciplinary approach to offer the best family and patient centered care. As such, we surround patients and their families with resources, empower them to make choices and actively encourage them to participate in their care. This unit seeks leaders in the nursing community who desire to join our mentors and preceptors in guiding nurses to maximize their technical, human, conceptual and diagnostic skills. CVC-5 is committed to recognizing and celebrating the value all team members bring to the unit, and to helping you to maintain a balanced professional and personal experience. A 27-bed telemetry and general medicine unit tailored for internal medicine patients who require telemetry monitoring, with Medicine Faculty Hospitalists as the primary admitting service. Nurses utilize the nursing process to provide primary care to the complex medicine patient population. The position entails direct supervision of unlicensed personnel. As a dynamic and progressive unit, staff on 7A utilizes bedside report, geographical nursing and hourly rounding as standards of nursing care. A 32-bed Adult Medicine Telemetry unit utilizing the nursing process to provide primary care to the complex medicine patient population who may require telemetry monitoring. Nurses complete a 6-10 week orientation including classes on basic arrhythmias and electrophysiology. Our RN staff and non-licensed technical staff provide highly skilled nursing care to our patients in an atmosphere that values individual diversity and uniqueness. A 32-bed telemetry unit serving patients whose diagnoses consist of heart failure, PTCA/stent, arrhythmias, ICD/pacemaker, pulmonary hypertension, acute coronary syndrome and myocardial infarction. Patients not only receive care for their illness but receive extensive teaching as well. Our staff consists of registered nurses and assistive personnel. Many RN staff are ACLS certified. There is a charge nurse for each shift and the day shift charge nurse rotates on a monthly basis. Each RN completes a 6-12 week orientation that consists of basic arrhythmias, management of the ACS patient, electrophysiology and interventional patients, and heart failure patients. 8D is a 20-bed, 24-hour Intermediate Care unit which provides care for acutely ill medical-surgical patients as well as those patients who are in transition from ICU to general care and rehabilitation floors. Our patient population requires highly skilled nursing care for the chronically ventilated patient as well as those patients who have difficulties weaning from ventilator support. We care for a broad variety of medical diagnosis and service many different medical teams in the institution. An 42 bed, close observation medicine unit. Caring for patients with an expected 23-hour length of stay, this unit’s patient population is typically composed of Emergency Room and clinic admissions associated with: cardiac monitoring, shortness of breath, abdominal pain,syncope, GI bleeding, anemia, dehydration, pneumonia or hypertension. Nurses maintain a continual focus on close patient observation, and complete, effective and timely patient education. A 13-bay, post-procedural unit caring for patients with an expected 23-hour length of stay. Caring for patients with an expected 23-hour length of stay, this unit’s patient population spans a wide spectrum, including: Urology, Surgical Oncology, General Surgery, Endocrine, Plastic Surgery, Gynecology, Otolaryngology, Maxillofacial Surgery, Neurosurgery and Ophthalmology.